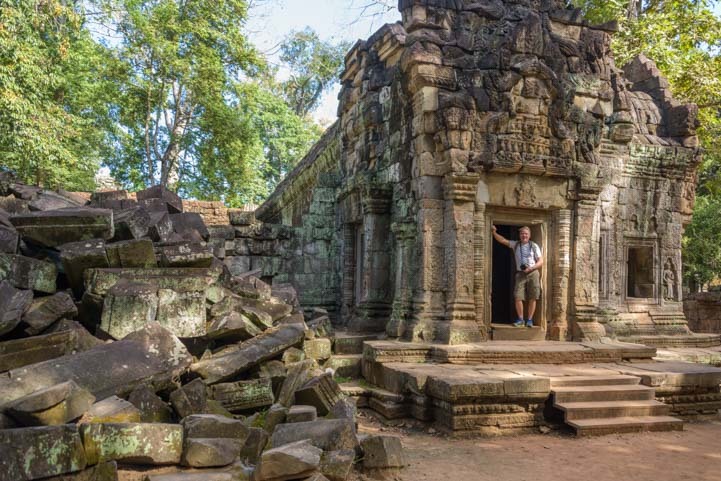 As soon as I saw images of the fabulous and mysterious ancient Khmer ruins that dot the landscape deep in the jungle at this breathtaking UNESCO World Heritage Site I was hooked and made plans for us to fly from Bangkok, Thailand, to the town of Siem Reap in Cambodia. 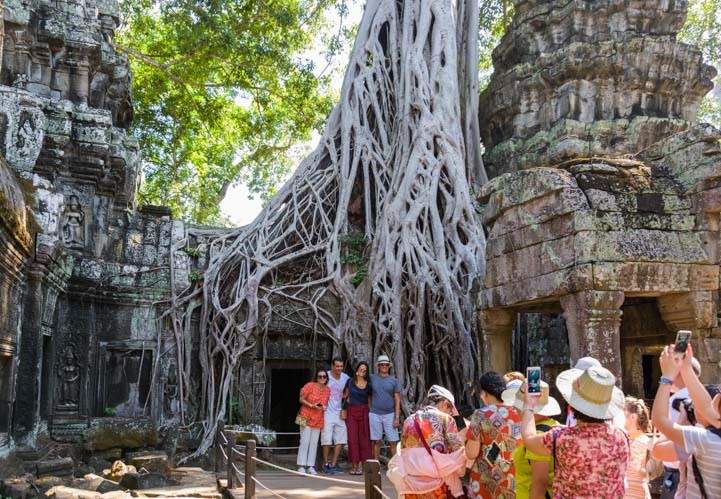 When we arrived in Siem Reap we were astonished by what we found. 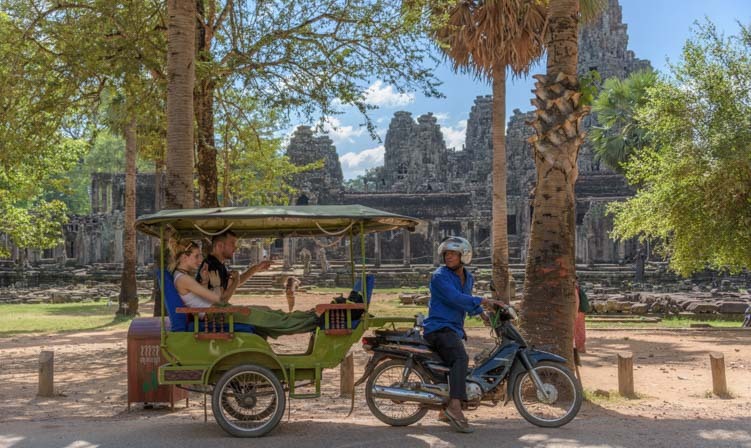 A tuk-tuk driver takes tourists to the ancient Khmer ruins at Angkor Archaeological Park in Cambodia. 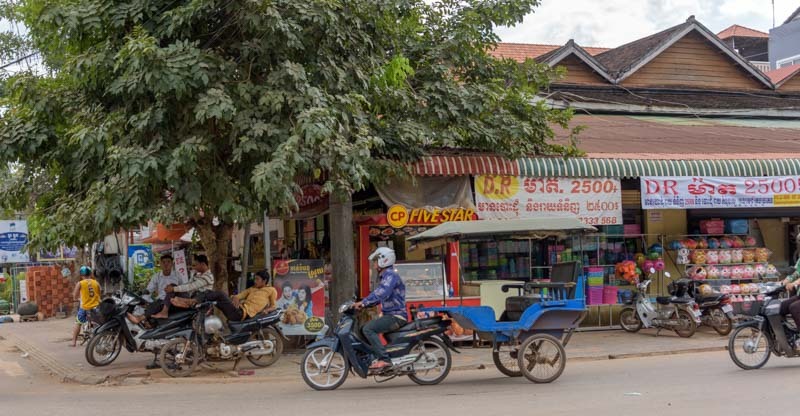 Siem Reap hums with life and the streets are filled with people on motorbikes and tuk-tuks going about their daily business. We took a walk to the heart of town from our hotel and couldn’t believe the crazy traffic in the street as one motorbike or tuk-tuk after another whizzed by. Families scoot around town on their motorbikes. 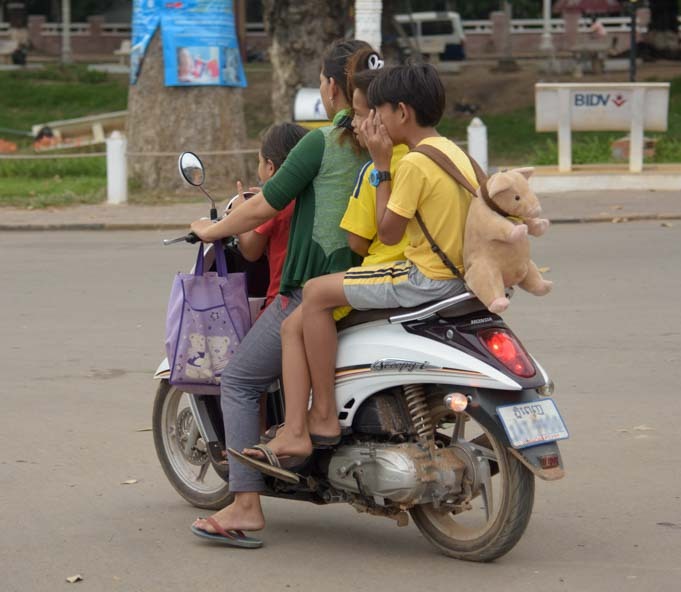 Whole families climbed aboard their motorbikes to get around town, often with mom, dad, the kids, and maybe even the baby all hanging on as the family zipped around town doing their errands. Sometimes even a teddy bear got to come along for the ride! Even Teddy gets a ride on the back! Cars mingled with the busy two-wheeled traffic, and we saw little buggies of all kinds that weren’t familiar to us. We couldn’t stop our cameras from clicking constantly as we tried to capture the wild scene. We saw some cool vehicles we don’t see back home. Standing on an insanely busy street corner where four streets came together and crammed themselves into one before going over a bridge, I took my camera down from my face and closed my eyes to listen. Small engines and narrow tires whooshed past in a constant stream, but the air was filled with life and there was a peacefulness to it, a happiness and contentment I couldn’t put my finger on. The rare toot of a horn was just a notice of “I’m here,” rather than an angry honk yelling “You’re in my way!” and everyone seemed to zig-zag around each other and get to where they needed to be without pushing or shoving or being mean. The traffic was insanely busy and non-stop. I looked over at Mark to say something about this to him, and noticed he was no longer taking photos either and was in the same kind of trance I was in. “It’s like flowing water,” he said, mesmerized. We began to stroll along the river and suddenly saw bunches of schoolkids walking home from school, smartly dressed and carrying huge backpacks on their backs. 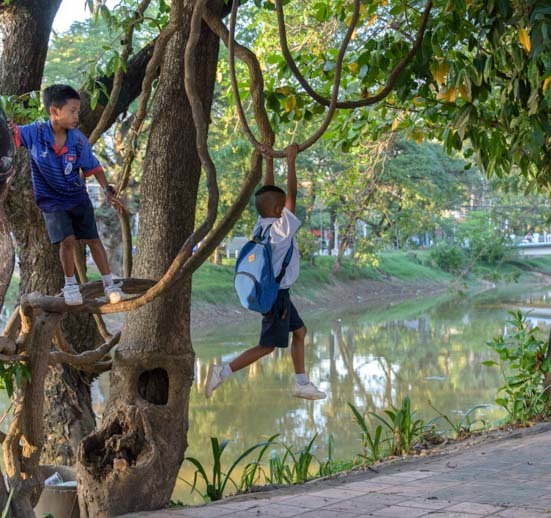 A group of boys raced each other and bounced around on the sidewalk, laughing and teasing each other, and then they swung themselves into a tree to dangle from the thick vines in total glee. What a cool place and what a great vibe! Schoolkids walking home from school stopped to take a quick swing on the vines. 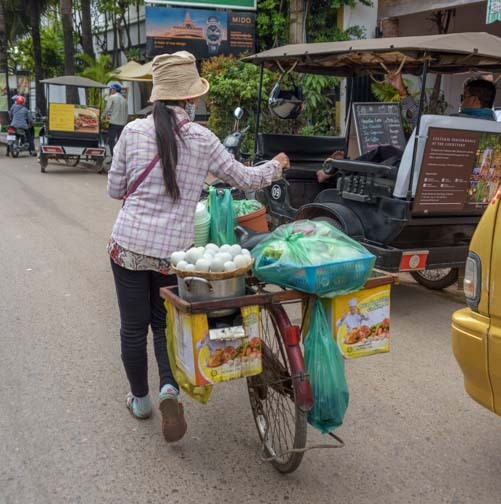 The traffic of motorbikes and tuk-tuks continued to flow past us endlessly, and we saw vendors going about their business selling their wares from bikes and carts. Junior gets a ride underneath! 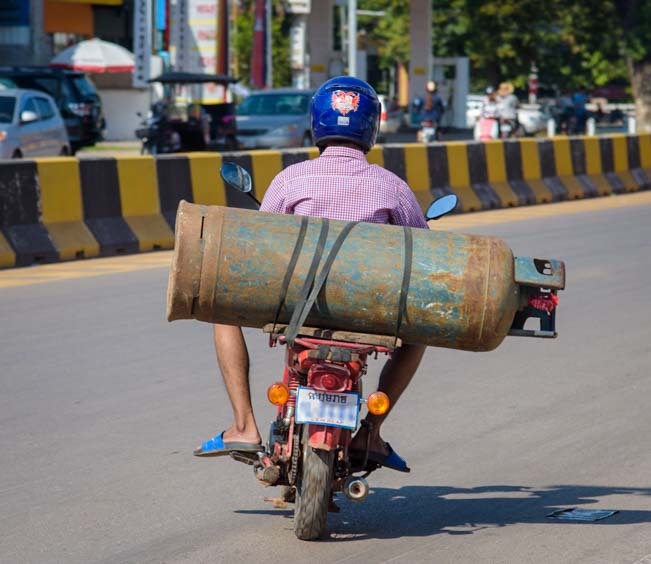 And if anyone had a heavy load to carry but relied on a motorbike to get around town, well they just strapped it onto the back of the bike! Where there’s a will there’s a way! 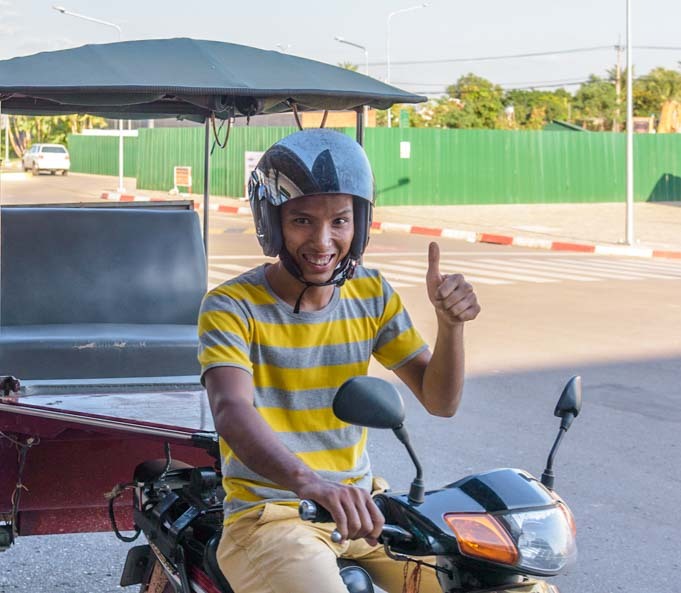 Our friend who had suggested we go to Siem Reap and Angkor Wat had emailed me the most enchanting story of when he had hired a tuk-tuk driver to take him around town and show him the sights. 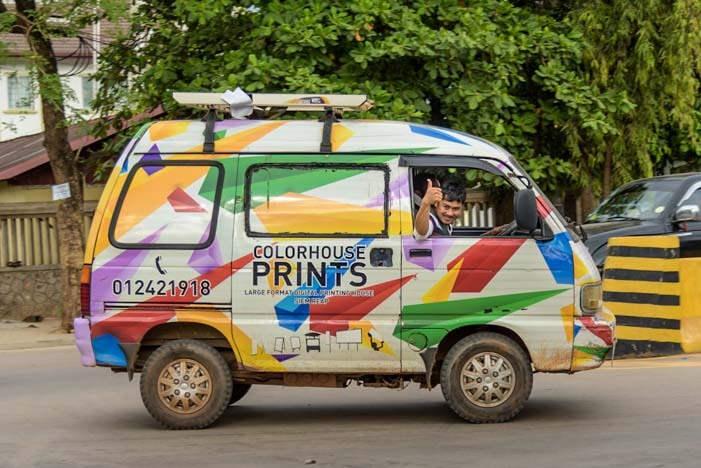 I loved this idea and hunted around online for a tuk-tuk driver. 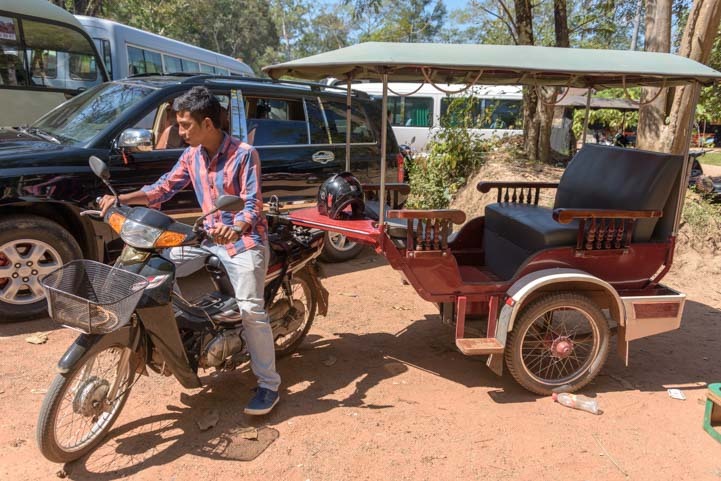 I found the website of a very sincere sounding young man of 25 that had started his own tuk-tuk business by investing in one of these unusual rigs and hanging out his shingle online as a driver (website here). 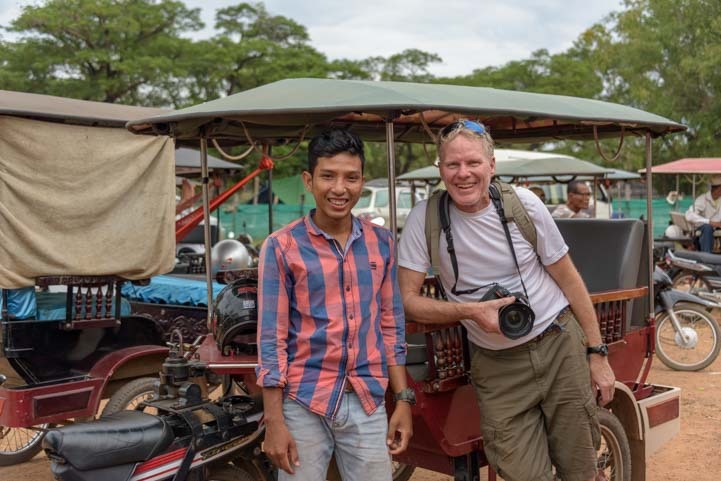 Mark with our tuk-tuk driver Pisal Rom. His name was Pisal, and I emailed him a few weeks before our trip. I was tickled to get an email right back with a quote for his services. It would be about $20 a day to have him chauffeur us around town and take us to any of the temples we wanted all day long. Signing up with him was a no brainer, and a few email exchanges later we had worked out the days and times and which temples we would go see. 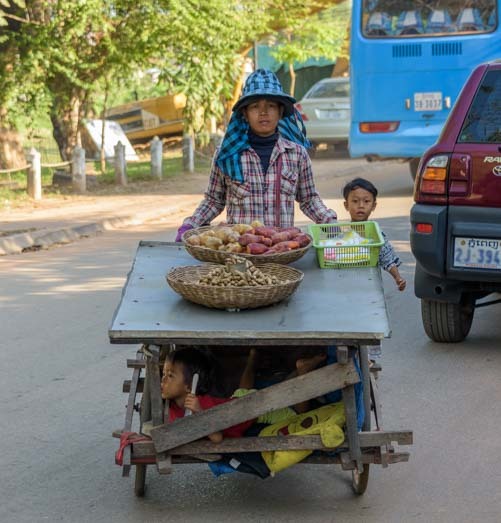 Being a tuk-tuk driver is an entrepreneurial and independent business venture in Siem Reap, Cambodia. He even came to the airport to greet us, and because I had sent him a link to our website he recognized us right off the bat! This was very handy because at least 50 cab drivers and tuk-tuk drivers greeted our plane holding up signs with names on them. All of us tourists were in a daze after going through customs and getting fingerprinted electronically (thumb and then all four fingers of each hand), and we stood there lamely trying to find our names in the sea of signs! Pisal picked us up at the airport when we arrived and took us to our hotel. The next morning he picked us up at our hotel and took us to the Visitors Center where we bought tickets to the Angkor Archaeological Park. 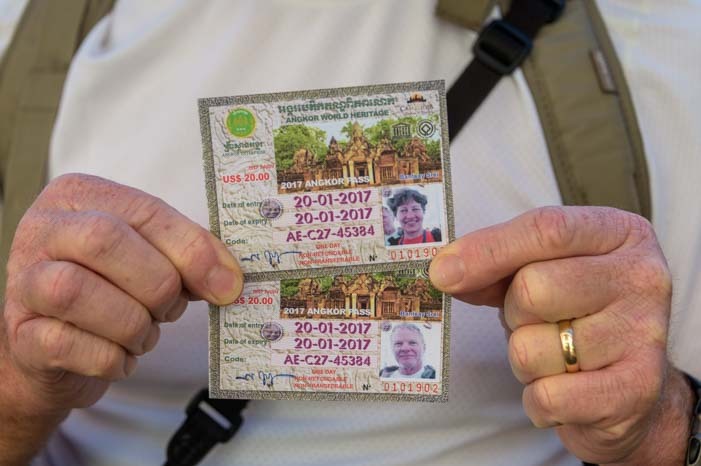 Just like the very formal process we had gone through at the airport where we had been fingerprinted in order to obtain printed visas in our passports to enter the country, our one day tickets to Ankor Archaelogical Park were adorned with our mug shots! 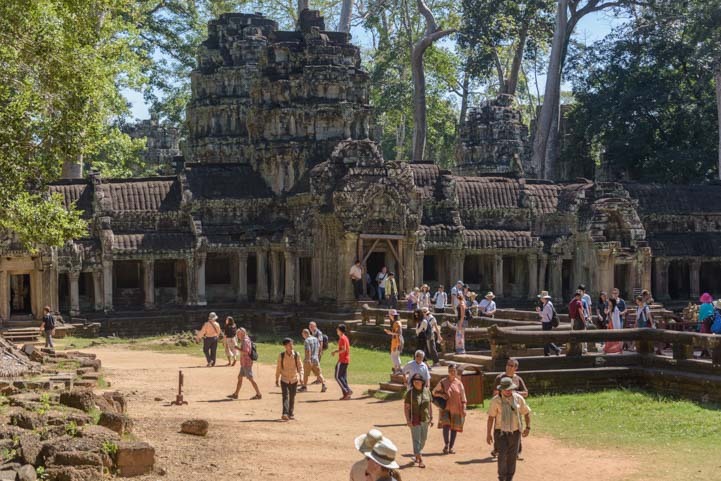 Our one-day tickets for the Angkor Archaeological Park had our photos on them! We hopped in the back seat of the tuk-tuk and enjoyed a quick ride to our first temple of the day. Almost all the vehicles on the road were tuk-tuks like ours with tourists sitting in the back. In various spots we saw groups of tuk-tuks parked, waiting to take someone for a ride. 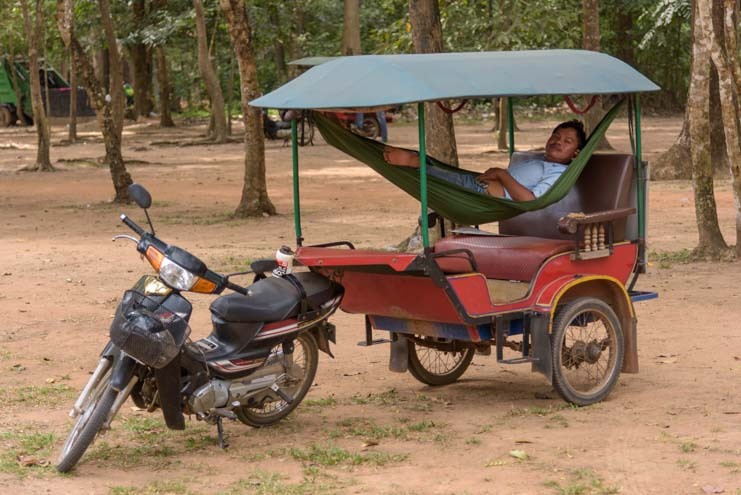 One tuk-tuk driver we saw had an ingenious way to relax between customers! 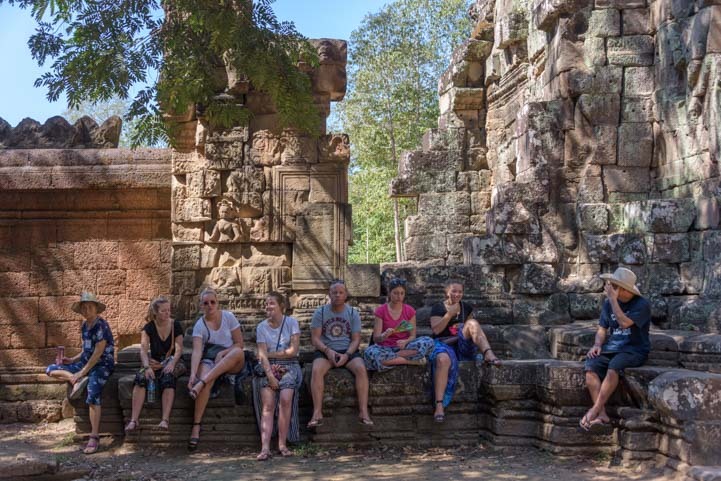 And then we arrived at Ta Prohm temple, a magnificent group of structures built in 1186 by the ancient Khmer king Jayavarman VII. 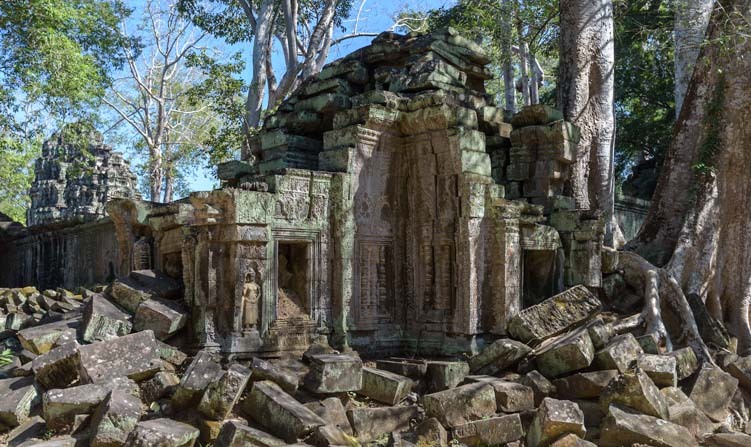 Like most of the ancient Khmer ruins, the buildings are carefully positioned and laid out. 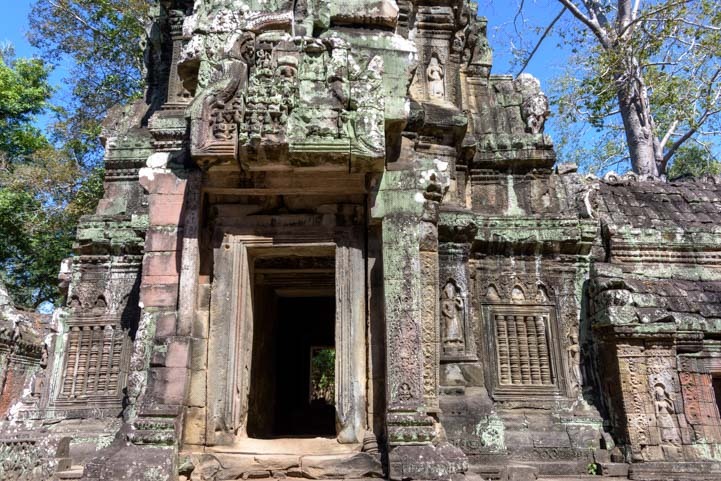 Ta Prohm has entrance gates facing in each direction of the compass. 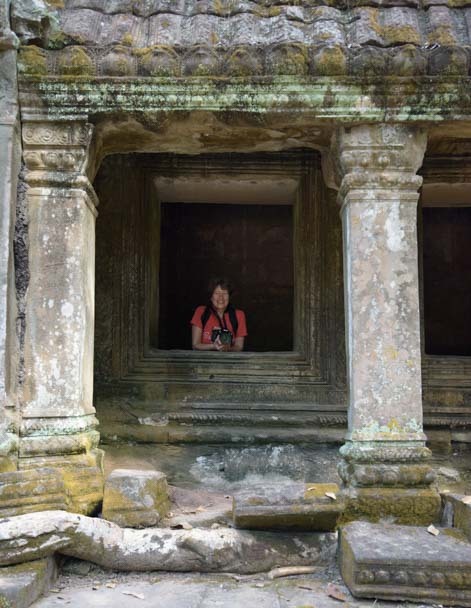 I hadn’t fussed over the history of these ruins before our arrival, preferring instead to let the experience of seeing them wash over me as if I were an archeologist discovering them for the first time. 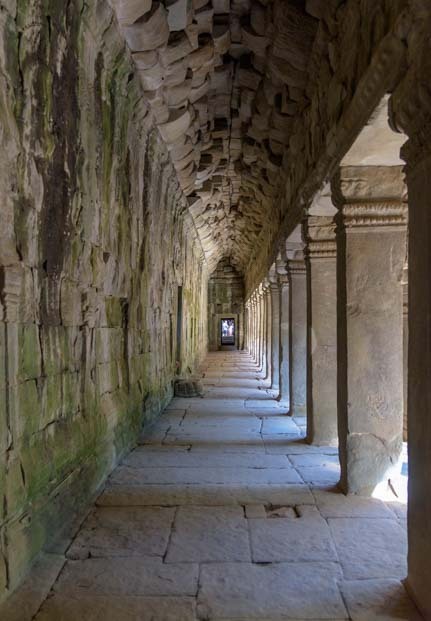 As we looked down a hallway with columns on one side opening into a courtyard, I was struck by how the shape of the arches was identical to that of the Mayan ruins we had visited at Palenque in Chiapas, Mexico. 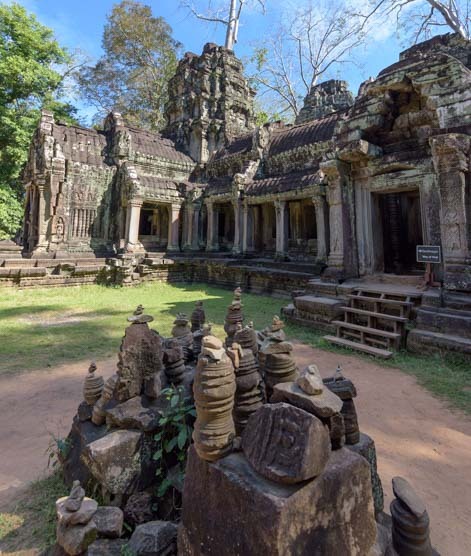 The ancient Khmer temples were built about three hundred years after the Mayan empire fell, so who knows! Certainly, many aspects of the ruins reminded me of the Mayan ruins at Yaxchilan. The shape of these arches reminded us of the arches in the Mayan ruins in Mexico. We found all kinds of nooks and crannies to explore. 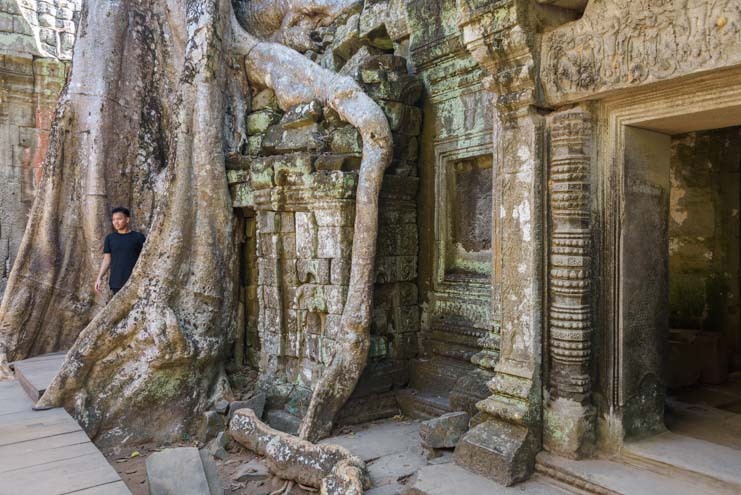 One of the things that is most impressive at Ta Prohm temple is that almost every stone used in its creation was carved with decorations. The carvings are on doorways, lintels, windows and in every corner. 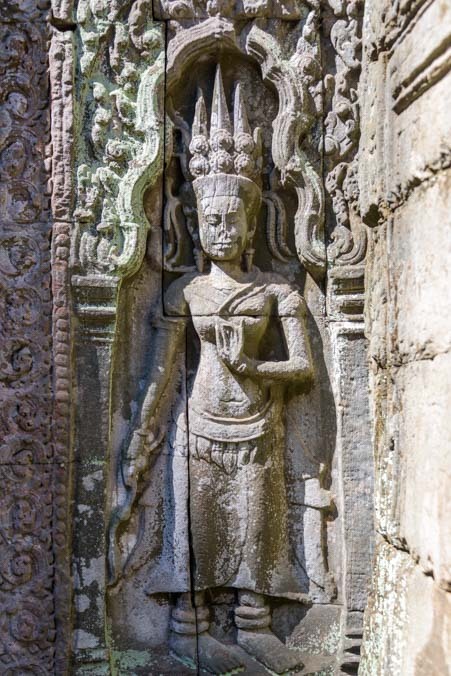 Almost all the stones on the walls, windows and doors were carved with wonderful sculptures. I wandered down one hallway and found myself standing next to a wall that was intricately carved with a floral pattern from floor to ceiling. This pattern was repeated, floor to ceiling and a few feet wide. 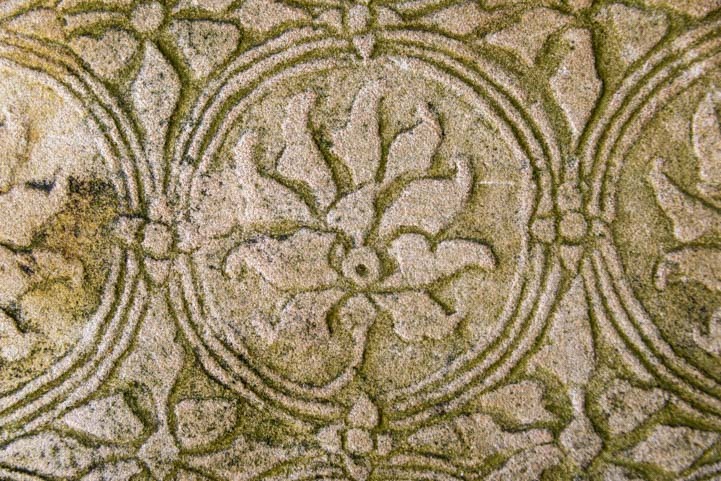 Ancient wall paper! Stepping outside, I noticed that the outer wall of one building had carved sculptures inset into the entire length of the wall. The outer walls had statuary built in. 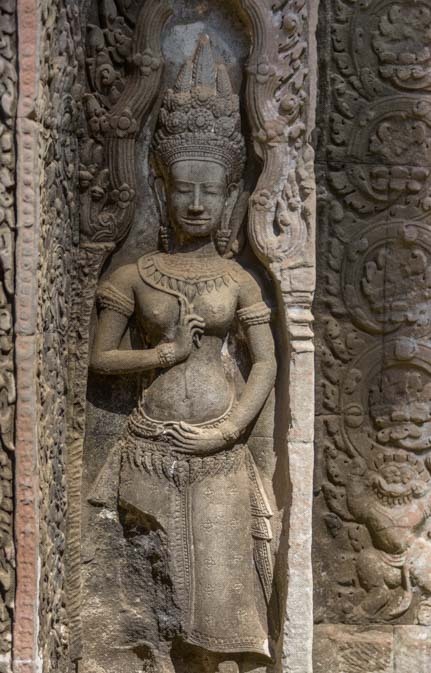 The ancient Khmer people were Hindus when the temples were built and later changed to Buddhism. The more we looked, both outside and inside, the more carvings we saw. Every inch has elaborate carvings! The doorways — and there were dozens — were truly ornate. The dozens of doorways were all similar but no two were exactly the same! 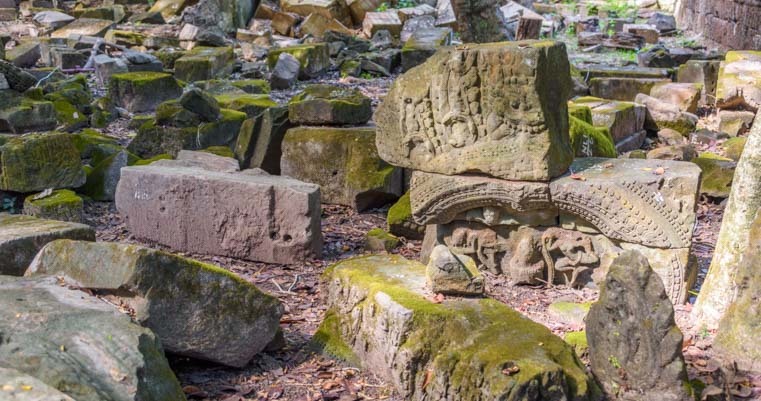 Oddly, the entire Ta Prohm temple ruin was strewn with enormous boulders that had once formed the walls and ceilings and floors of rooms that were no longer standing. 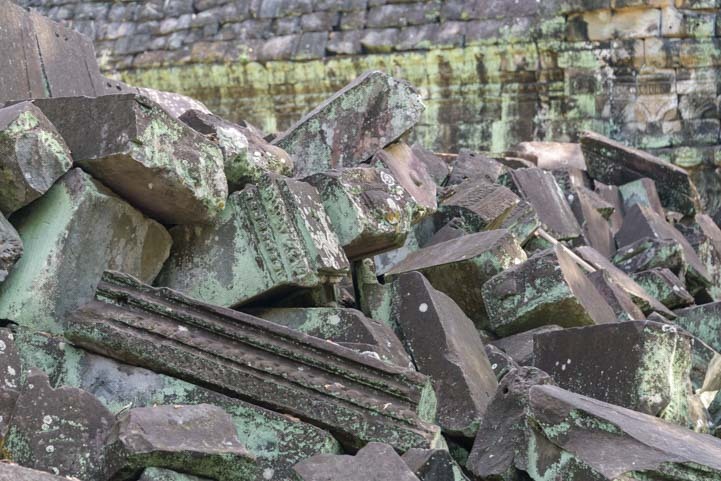 Both outside and inside the temple buildings were rubble piles of large stones that had fallen. These piles were often waist high or more! 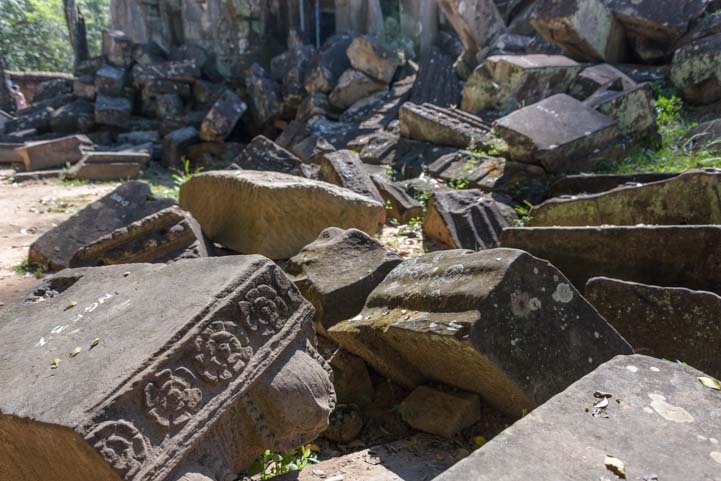 Wonderful columns — and lots of rubble, including a column piece to the left. Beautiful – but what a mess! Looking closely at the rubble, we could see stones that had been carved. Many stones in the rubble had carvings on them. 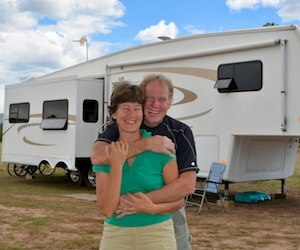 It was like an enormous jigsaw puzzle that just begged to be put back together again. Sometimes it was easy to see how the stones had gone together before the wall or roof collapsed. 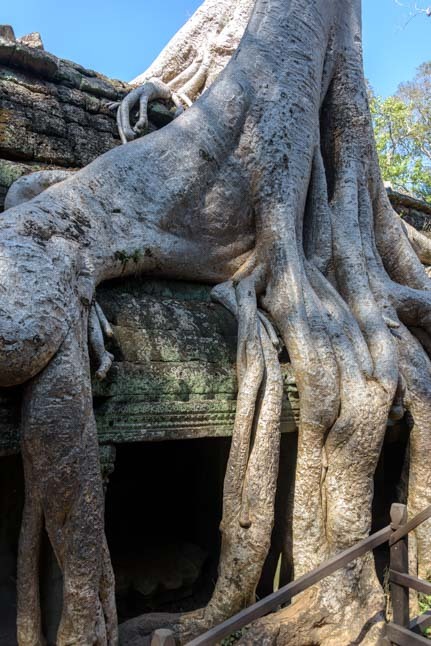 But what Ta Prohm temple is actually known for is the gargantuan trees that have enveloped the ruins with their roots. 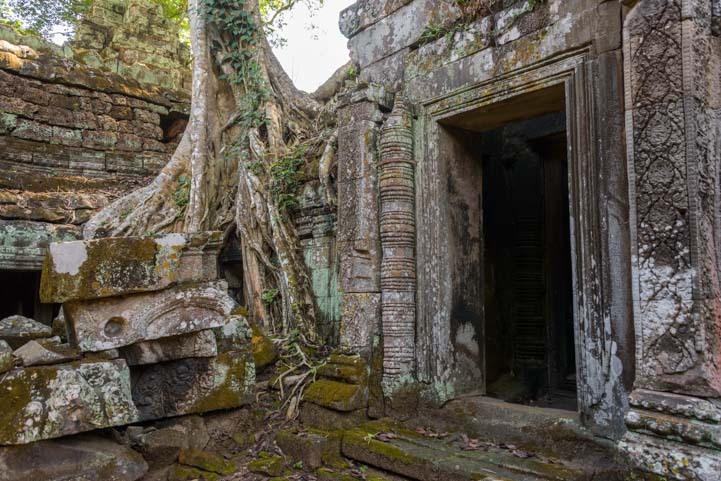 It is known as a “Jungle Temple” because it has truly been engulfed by the jungle. 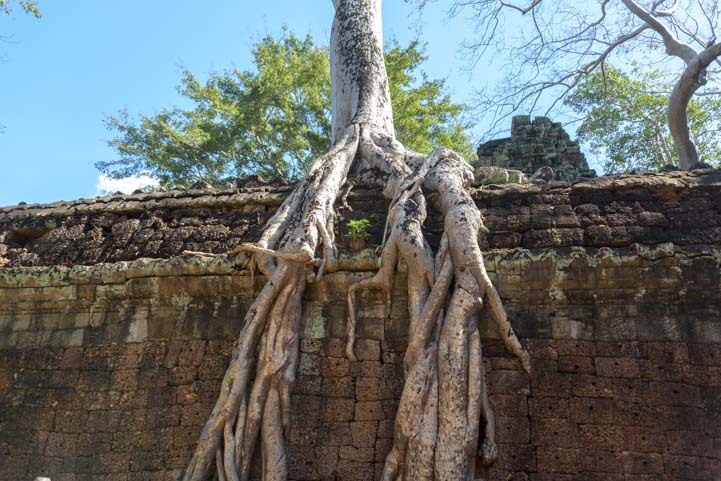 Walking along the outer wall of the temple, we saw the most incredible tree and root system snaking over the wall. 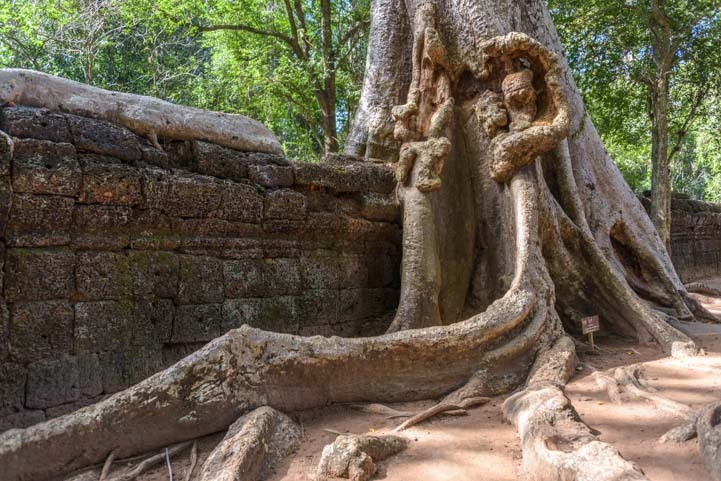 Ta Prohm temple is known for the Invasion of the Giant Trees. 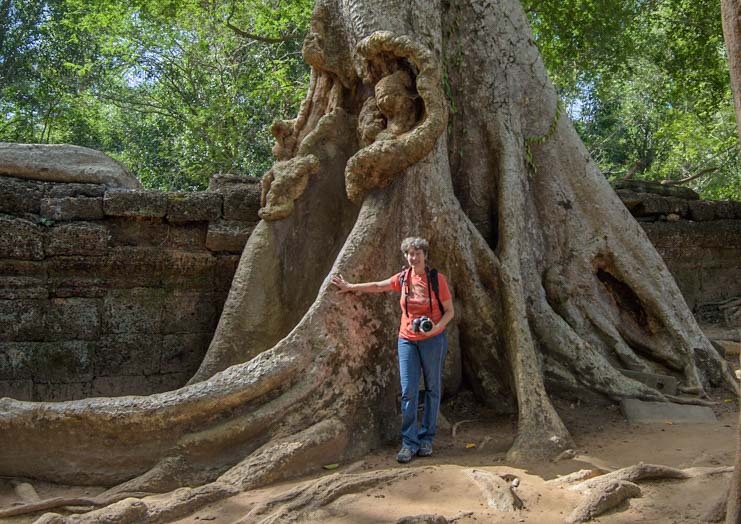 Trees like this were all over the place, their gnarly roots reaching out across the walls and buildings. 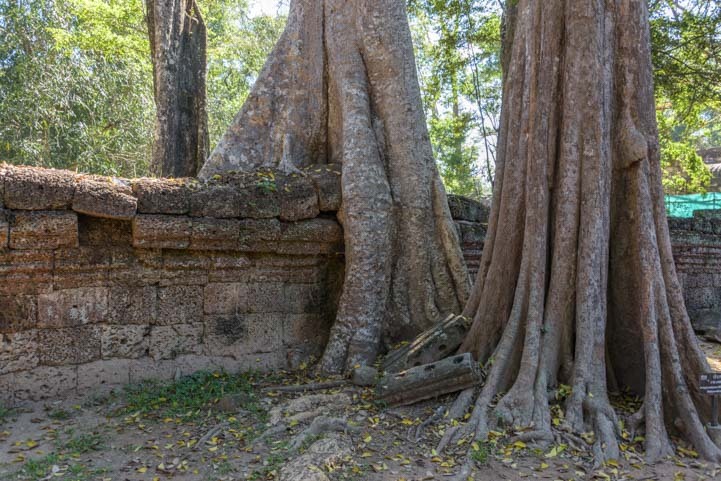 In some places it seemed like the roots were flowing from the tree down across the temple buildings. 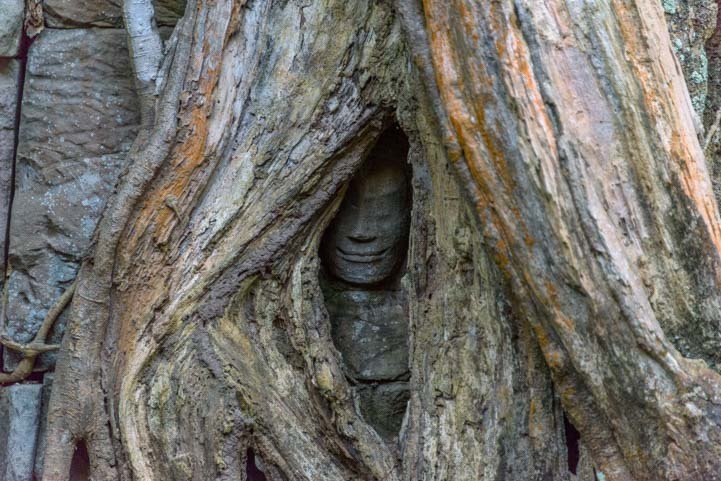 I turned one corner and noticed the head of a sculpture peeking out at me from between the tree roots!! Hey… there’s a face in there! 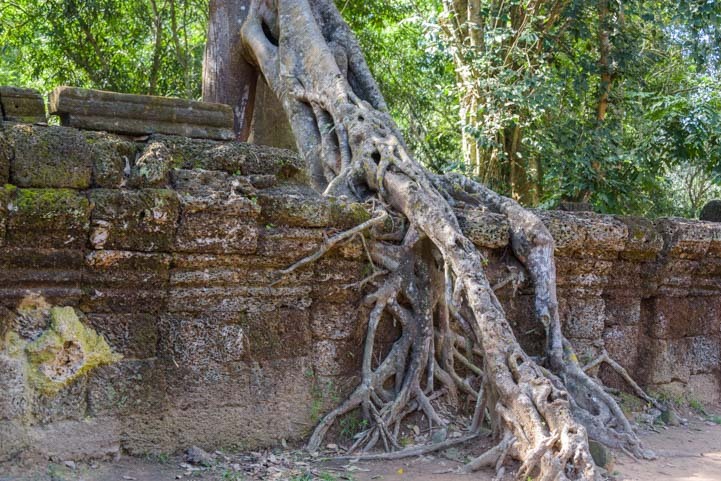 Everywhere we turned, the trees and roots had taken over the temple. 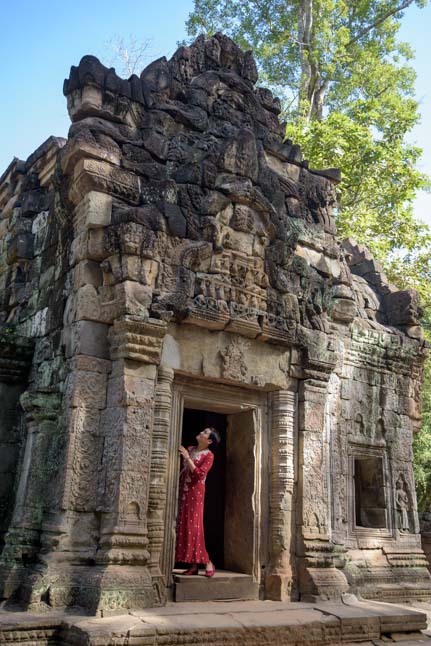 The temple of Ta Prohm was used as a location in the movie Tomb Raider starring Angelina Jolie, and some of the places were recognizable to tourists and were favorite spots for selfies. 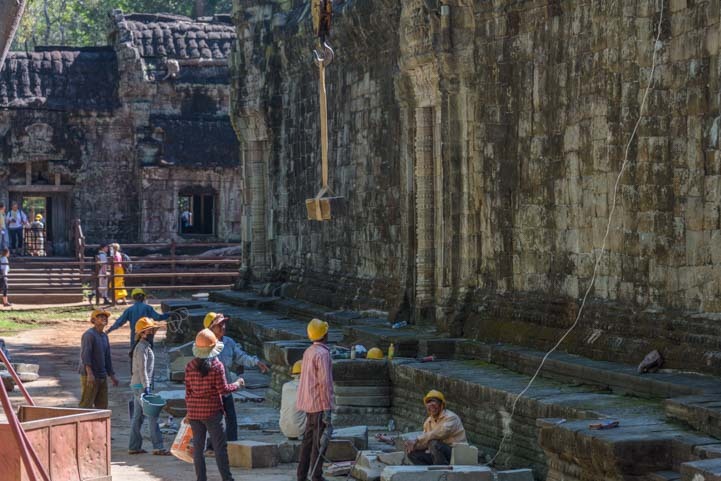 Ta Prohm is undergoing renovation and construction to put various bits back together again and to make it easier for tourists to get around, and we saw construction crews here and there with hard hats and cranes. Construction workers in hard hats watch a stone being lifted to the roof. Eventually we wound our way back to the entrance gate where the crowds were growing ever bigger. When we returned to the entrance there were lots of tourists coming in. 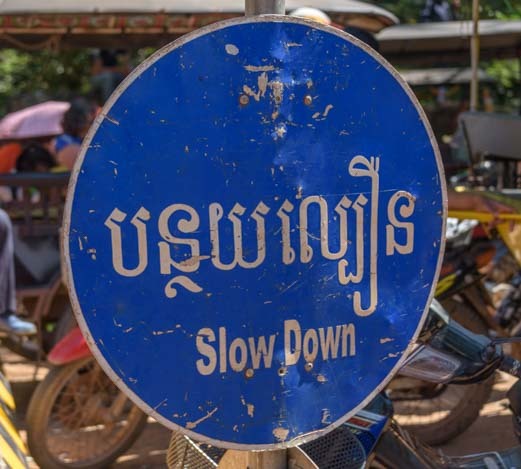 We spotted a sign suggesting we slow down a bit. 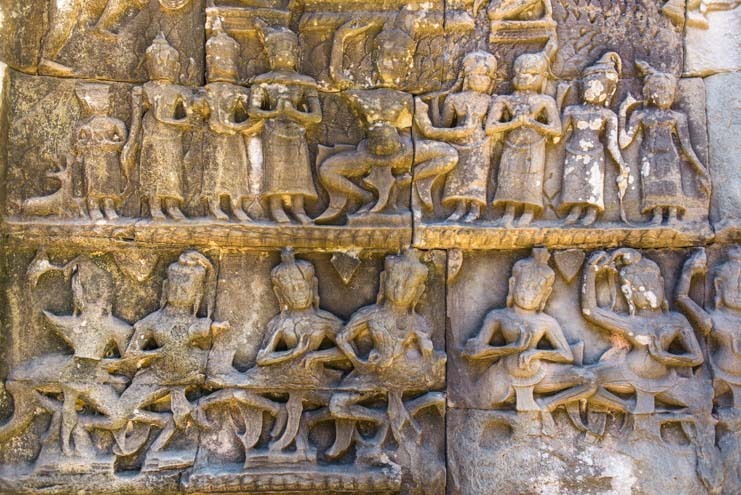 Cambodian letters are not from the Roman alphabet. But they’re not Thai letters either! 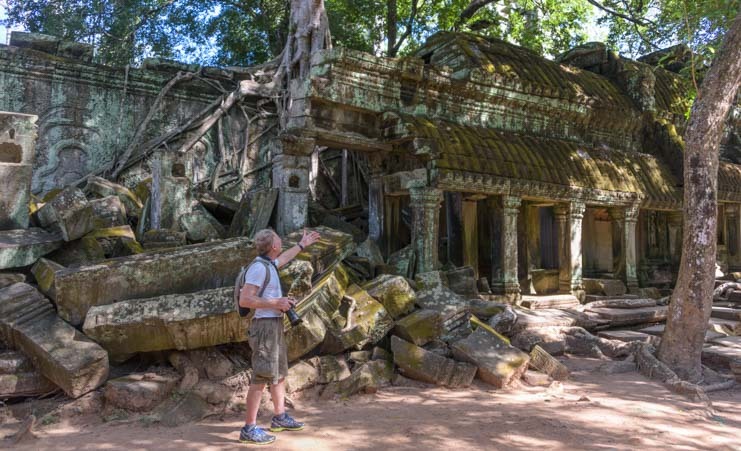 Nearby we saw lots of tourists who had been approaching Temple Sightseeing Overload (which is easy to do in this part of the world where Ta Prohm is just one of dozens of exotic ruins). They were taking a load off in the shade. But we were still fired up. We found Pisal waiting for us and hopped in the back of his tuk-tuk for more temple adventures! 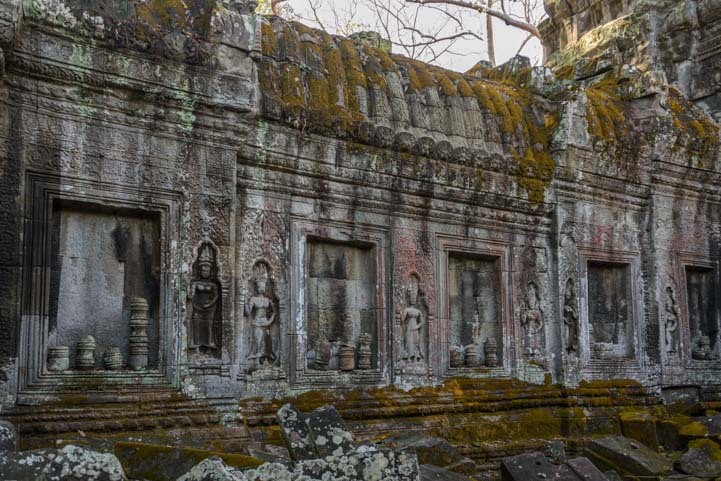 This area is so rich with ancient Khmer ruins it would take many months to see them all. 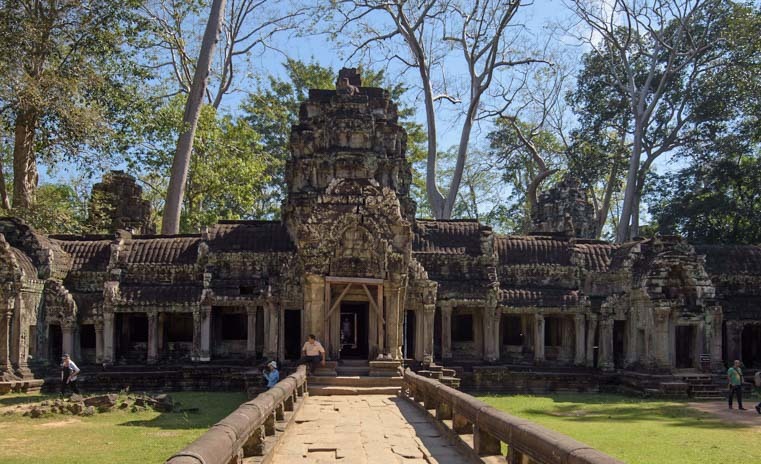 We’ve seen quite a few ancient ruins in our travels now, and I found it fascinating to put together a timeline of who was building and living in which places at various times in history. The meso-American ruins of Mexico and Central America predate all the others by a few hundred years. 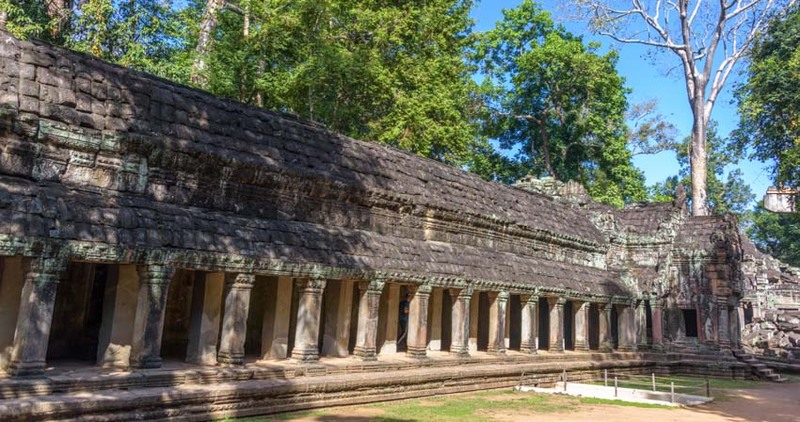 Interestingly, the ancient Khmer temples and kingdoms of southeast Asia were built about the same time as the cliff dwellings of America’s southwest! 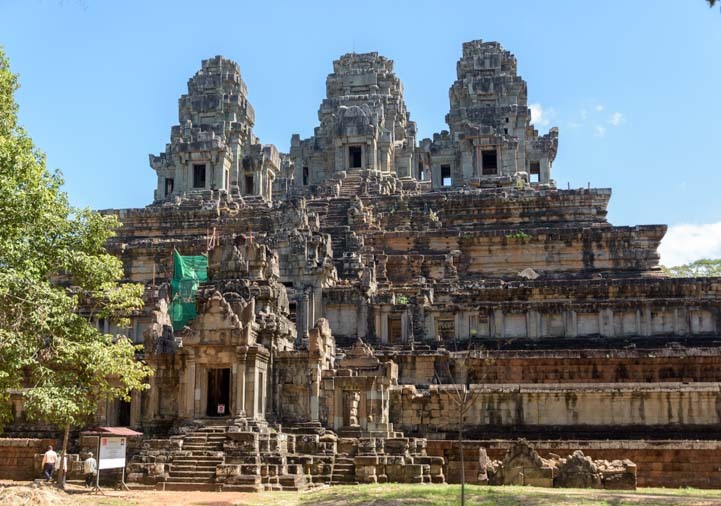 Siem Reap, Cambodia (WikiTravel) – A very cool town worth visiting for more than the 3 days we did! Tonle Tropic Hotel – Our hotel…Excellent! 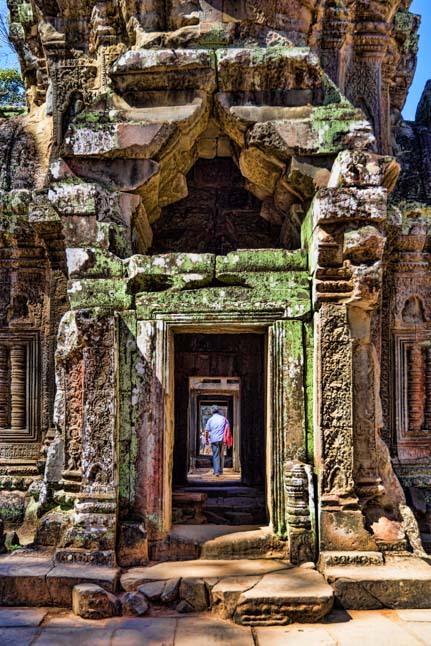 This entry was posted in Cambodia and tagged Ancient Ruins, Cambodia Travel, National Parks Cambodia, New, Travel, WP Travel by Roads Less Traveled. Bookmark the permalink.